As I mentioned at the beginning, there are three different words for the question “how?” in Thai language. It denpends on what you are asking for. We know the meaning of เท่าไหร่ for ‘how much?’. It is also used for questions ‘how’ when asking for the answer that can be measured in numbers. For instance asking for age, weight, height or duration of time. jàak tâa Saphan Taksin bpai tâa Ratchawong chái way-laa naan tâo-râi? How long does it take from Sapan Taksin pier to Ratchawong pier? kun jà yùu bprà-tâde tai naan tâo-rài? How long will you stay in Thailand? ประเทศไทยสวยแค่ไหน bprà-tâde tai sŭai kâe-năi? คุณรักผมมากแค่ไหน kun rák pŏm mâak kâe-năi? แกงเขียวหวานเผ็ดแค่ไหน Gaeng kǐae-wăan pèt kâe-năi? Just remember that if we are not asking for method or if the answer can not be measued in numbers , we will use the question แค่ไหน? There are three different ‘HOW’ question words in Thai. It means old-fashioned or outdated. We use เชย /cheoi/ to describe things that are outdated or people who don’t keep up with the latest news or people who are not aware of things that are in trend. It means ‘very, super’. It . It is actually a rude word, but it is ok to use it among your close friends. This word can be used for both positive and negative meaning. Fried Chicken Noodle in Chinatown is super tasty! โคตรร้อน kôot ráwn (very hot). This is a widely used slang among Thai. I think it is dervied from English word ‘over’. It is used to describe someone who exaggerate or talk about something that sounds hard to believe. Or do something too much. Very good tutorial. The video really makes it easier to practice pronunciations. Thanks! So amusing to see your role play. Really enjoyed it. Thank you! Thanks for the Thai Tutorial. Hi Mod, i was looking at YouTube Thai lesson 12, verb to be, “bpen”. I’m confused! In the first part of the lesson your showing “kao” with a high tone, then in the summary part your showing “kao” with a rising tone? Is a rising tone wrong or is this how it should be? Hi Chris, apologies for the delay in my response. Thank you for watching my video and sorry for the confusion. There are two versions for the word ‘he or she’ in Thai; the written form is “เขา kăo” with rising tone, but when speaking, it is spoken with ‘high tone’ so many people write this word with high tone “เค้า káo” to match the current pronunciation. I usually like to write this word with high tone but sometimes I mix them up. Thanks for the reply Mod. One of these day’s i will have some lesson’s with you! If your not too busy. I need to brush up on my Thai. Any chance of getting these in audio format? That would be great. 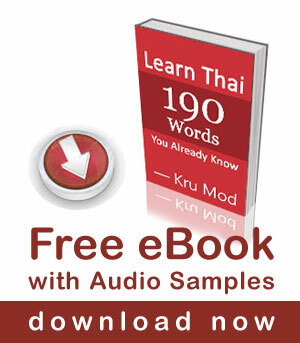 I can rely on you so much, for allowing me to make much progress in learning Thaï language ! I say THANK YOU again to both of you, and MANY CONGRATULATIONS for your very attractive way you teach Foreigners who get very interested by your good job, then ! Thanks for the video! You make everything so easy to understand. You said that ‘How much do you love me?’ is คุณรักฉันมากแค่ไหน … Does this mean that I can write ‘How much do you miss me?’ As คุณคิดถึงมากแค่ไหน or would I not write มาก? I obtained a lot of benefit from this lesson. Thank you so much Mod and Pear! Hopefully that you will give us more explanation of synonyms in the future lessons. เท่าไร sounds old-fashioned, now we only use เท่าไหร่ ka. You girl do such a great job. I really miss these videos. They are so great. So…to me เท่าไร sounds very much like เท่าไหร่ Is the tone just different? how and where i can download your video? im am traveler as know as Backpacker , and what your teach is very good for me as traveler ..
Nice lesson, you girls do a great job. The lessons are very well structured, easy to follow and the video quality is excellent. Just to add something here, maybe you could have also included the alternative to yang-ngai (ยังไง) which is yàang-rai (อย่างไร). Thanks Krue Mod & Pear, great job! Oh and well done the (new) camera person and editing and actors of course!